Located in the neighborhood of Pompéia, within the West Zone of São Paulo, and designed in 1986 by Italian architect Lina Bo Bardi, SESC Pompeia is a quintessential fixture of Brazilian architecture. It’s currently hosting Terra Comunal - MAI, a retrospective of Serbian artist Marina Abramovic plus a workshop and performances presented by her eponymous institute. The show is open through May 10. 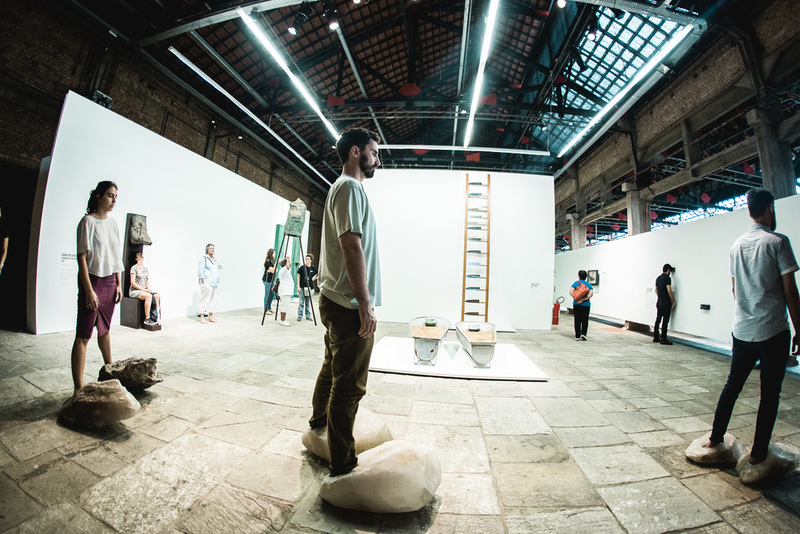 Bo Bardi and Abramovic have their own strong aesthetic identities, but one thing they share is an appreciation for Brazilian culture. 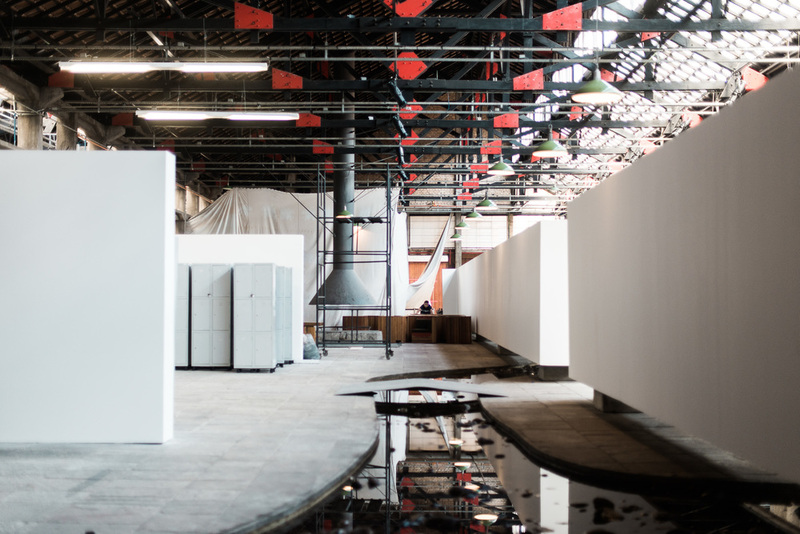 The Marina Abramovic retrospective received support from São Paulo architecture firm Metro, led by architect Gustavo Cedroni. The curatorial process highlights the importance of exhibition design, a topic that is of increasing interest in the field today. Before we talk about building walls to house artworks, I'll ask you about the process of understanding space. What type of research did you do to understand the existing structure of SESC Pompeia? Marina frequently says that on her first day here, she understood the space in a very sensitive way. SESC isn't a museum, so many other activities take place here. The exhibition design, which is very dependent on walls, was meant to coexist with everything else that happens in the space. The initial goal was to interfere as little as possible while having a large volume of artwork installed at SESC. This aim became clear when we look at the two large walls that anchor the exhibition: on one wall there's the retrospective, on the other wall, the Abramovic Method. For the Method, we basically created a physical barrier so as not to disturb anyone participating in the exercises. By raising those walls off the floor, we developed this continuum of light coming from the ceiling, and especially from the floor. We built a freestanding structure that raised the walls and made the space much more fluid. Aside from thinking about the space in terms of showcasing such a great artist as Marina Abramovic, there was another key issue for the architects. We're talking about one of the classic landmarks of the Brazilian architecture. 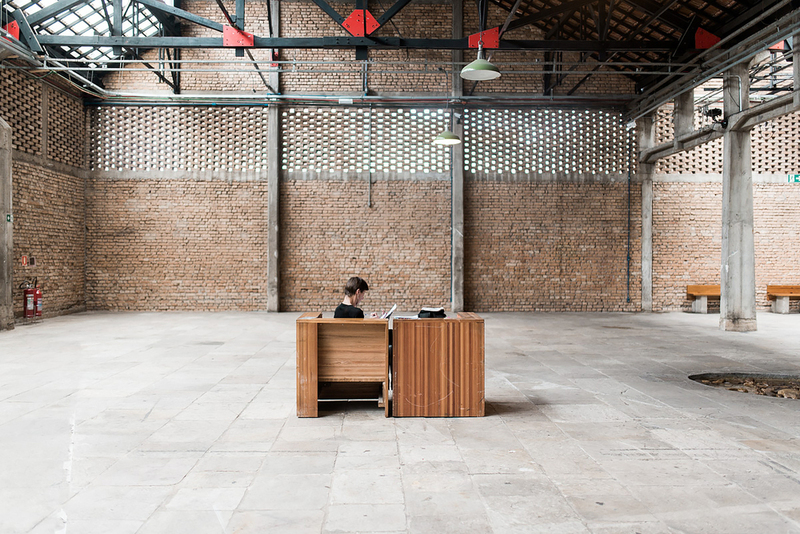 How does one attempt to design within a building created by Lina Bo Bardi? It wouldn't make any sense to build a white cube inside a location like this. This is the funniest part of this project. These works were practically asking for a white cube, a classic exhibition design structure. They're video projections, videos. The retrospective consists basically of performance works that have been documented on video. This building, however, is so powerful. Lina’s work is so compelling that Marina decided to make it part of the exhibition. There are elements of SESC Pompeia that are easy to connect with Marina's work, like natural light or water. But there's also the brutality of the floor, the concrete, the brick walls. This ends up showing anyone who comes here something new to see the works of Terra Comunal - MAI. Our responsibility is to differentiate between a recent architectural intervention and that which is originally from the building. The new design is white and neutral, with few forms, and as powerful as the preexisting structure. The space is not very segmented, defined primarily by two parallel lines. When you describe the exhibition's architecture, you talk about materials. The artworks created by Marina are fundamentally about the immaterial. What was it like working with materials to interpret this immaterial? The exhibition design should be a technical support to maintain the integrity of Marina’s exhibited works. The design should convey neutrality. The immaterial is all around SESC on a regular basis; there are people queueing to buy concert tickets, others reading. As architects, we seek a merger with materiality, with the flows of people. There are areas designated for certain activities both inside and out, but there are few rules about traffic flow. For example, you can enter through the center, the right, or the left. There's a marked path, but there's no imposed order. What are the specs of the supports for the artworks? Let's start by talking a little about the walls that were built for this exhibition. There are basically two types: freestanding walls defining the two exhibition centers: the retrospective and the Method. Behind these walls, there's a constructive system that is very complex, with metal trusses and wood panelling; but it’s not visible to the public. Also, there are walls with varying heights. They're prefabricated with a very simple structure, assembled inside SESC. They're self-supporting, we don't need columns. My office, Metro, espouses the philosophy not to think of the spaces for each event, but build an integrated system that could potentially be the solution to all future needs of that particular site. The floor remains the same as Bo Bardi designed. And no ceiling was built. These choices are full of meaning, but I imagine they must've made the process more difficult. Yes, for sure. There's still a very strong presence of the brick walls. The floor is still totally irregular, and most of the lighting is natural light. Options that don’t interfere with the main thing here, which is exhibiting works of art, are ideal; but we're also looking for attendance, we're trying to build relationships. We can't really see the person passing by in the exhibition room next door, but we can see a shadow, feet, a light that passes through. On the roof, we control that light with a screen. The floor definitely is a radical decision. The public can see thousands of spatial interventions happening here, the system speaks to the art. For example, work that is made of crystals is exhibited on a natural stone surface in Shoes for Departure. Those shadows, the light, and the feet moving under the wall make me think of a crucial concept of Terra Comunal - MAI that is a constant in all the performances: being present. How does the space designed for the Abramovic Method address this? To begin with, there's no physical partition. There are no doors. We didn't want to create barriers for the public. But here there's a natural partition of space, the rivers designed by Lina. During the exhibition, we removed the bridges she had designed for the space. They were made with big beautiful massive stones, but they were not enough for the traffic flow that we have here during the exhibition. We designed a bridge that is made of a single folded metal sheet, a clear surface within the space. Nothing is camouflaged in this case. On the Abramovic Method side, there's the first room, square-shaped and filled with instructional videos. In the area of the Method itself, there's a much stronger presence of the building’s original architecture. Here, it makes much more sense keeping the brick, concrete, and also the floor exposed, as they complement some very fine elements in the furniture used for Method exercises such as wood and crystals. They contribute to the atmosphere. We altered this space the least. It's the building in its rawest form. There's a symbiosis between materials and language. The rivers that cross the space, I always make the joke that they could have been requested by Marina. She always talks about the importance of water and reflections. It's a matter of rigor working with almost 100 people at once for the Method. The design of this area reflects this precision with specific axes. They're a great contrast to the undulation of the space. This aesthetic identity is modular, minimalist, but somehow there's a constructive heritage in it. Maybe I'm going too far, but I'd relate it to a Serbian memory. The building, however, has firm roots in Brazilian heritage. has. Here, the thing was the choice of combining forces: the force of Marina's performance work and that of Lina's design sensibility. Working with Marina is very rewarding, it really does keep everyone present. My process with her was never solely about exhibiting performance. Every time we met and discussed the plans, I was impressed. She has a huge repertoire, an impressive aesthetic sense and has a remarkable capacity for understanding spatial relationships.